Gummy stem blight, caused by the fungus Didymella bryoniae as the sexual stage (perithecia giving rise to ascospores) and Phoma cucurbitacearum as the asexual stage (pycnidia producing conidia), is a common disease of all major cucurbits and is present wherever they are grown. Both stages of the pathogen can occur on infected tissue during the season, but they vary in importance as inoculum sources. The disease has been reported in New York since the early 1900s. Gummy stem blight refers to the foliar and stem-infecting phase of the disease, black rot to the fruit rot phase (see fact sheet, page 732.10, Fruit Rots of Squash and Pumpkins). A wide range of foliar symptoms occurs on cucurbits, which can make diagnosis difficult. For example, on leaves of the muskmelon variety Earligold symptoms may be a water-soaked lesion on the leaf margin, interveinal necrotic scorch, and randomly distributed irregularly shaped circular lesions (fig. 1). Under certain weather conditions all symptoms may occur in a naturally infected field at the same time. Some lesions may be surrounded by a yellow halo, and when spots dry up, they often crack. On pumpkin, a non-descript marginal necrosisis followed by larger, wedge-shaped necrotic areas common to the earlier appearance of powdery mildew (fig. 2). The association of susceptibility to powdery mildew and occurrence of gummy stem blight is discussed later. Leaf symptoms on cucumber and squash are infrequent but are similar in appearance to those on pumpkin. Pycnidia, the asexual fruiting bodies, appear on affected leaves as small black specks, but if the tissue is rapidly killed, as on muskmelon, these diagnostic signs will not be evident on the foliage. Infected stems first show water-soaked lesions and later appear tan. Older stems, particularly of muskmelon and cucumber, show pycnidiawithin the affected tissue (fig. 3). Stem lesions often cause gummy, reddish-brown or black beads to exude, a symptom that can be confused with Fusarium wilts and injury caused by insect feeding. In the latter cases, however, pycnidia are not present. Perithecial fruiting bodies, which appear similar, may also be embedded in the same lesion. The gummy stem blight fungus is both seed- and soil-borne. The pathogen may be carried in or on infested seed. In the absence of host plants, the fungus can overwinter for a year and a half or more on infected crop residue. The exact length of survival in the Northeast is currently being studied. The fungus survives as dormant mycelium or as chlamydospores (thick-walled modifications of the mycelium). In northern areas of the country in the spring, pycnidia are produced, giving rise to conidia, which serve as the primary inoculum. Under laboratory conditions, young pycnidia appear light brown (fig. 4, left), whereas perithecia already are black (fig. 4, right). As the pycnidia age, they become black, as shown in figure 3. Conidia are released through a pore (ostiole) in the pycnidia (fig. 5), and if moisture is high, conidia exude as "spore horns" containing thousands of conidia (fig. 6). Conidia vary in size, are short and cylindrical, with usually one septum near the middle, or they may be unicellular. Under moist conditions, they are readily dispersed by splashing water. Both temperature and moisture are critical for germination, sporulation, penetration of conidia, and subsequent symptom development, but moisture (relative humidity over 85 percent, rainfall and duration of leaf wetness from 1 to 10 hours) has the greatest influence. The optimal temperature for symptom development varies depending on the cucurbit; for watermelon 75° F is optimal, for cucumber 75-77° F, and for muskmelon 65° F. The optimal temperature for muskmelon reportedly is lower because its resistance increases at high temperatures. This can be significant to determine when early-season disease scouting should be initiated for future control. Penetration by conidia is probably direct and does not need to occur through stomates or wounds. Wounding, striped cucumber beetles, and aphid feeding, along with powdery mildew infection, predispose plants to infection. The additional nutrients provided by such injuries enhance gummy stem blight infection. 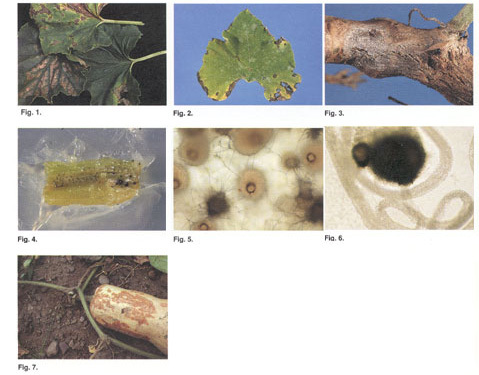 Symptoms of gummy stem blight (black rot) fruit infection may be evident in the field, as shown on butternut squash in figure 7, or develop later in storage. Disease-free seed should be used for all cucurbit plantings. Obtain seed from reputable sources. If seed is to be saved from open-pollinated varieties, these should originate from disease free plantings and should be harvested at a location where there is no contamination by airborne conidia. Use of seed disinfectants does not guarantee that all seed is disease-free. Seed disinfectants are more effective when used as solutions or suspensions than as dry dust treatments. To be safe, growers should follow a minimum 2-year rotation out of all cucurbits. To encourage decay of plant debris, crop refuse should be plowed under as soon as possible after harvest. Powdery-mildew-resistant (PMR) cucumber and muskmelon varieties should be grown to reduce the opportunity for gummy stem blight infections. PMR pumpkin and summer and winter squash will be available soon. Cucumber beetles and aphids should be controlled to reduce predisposing cucurbits to disease. Although the release of additional PMR cucurbits is imminent, chemical control of powdery mildew and gummy stem blight is important to reduce foliar infections and subsequent fruit infections. Recent research has shown that control of powdery mildew either by chemicals or by genetic resistance can significantly reduce black rot in pumpkin and winter squash. We currently recommend midseason control of powdery mildew (mid-July to earlyAugust) with the exact timing of specific sprays determined by scouting. Plants that already have set fruit are more likely to show early mildew infections. Powdery mildew inoculum arrives from southern states as airborne conidia and thus cannot be controlled by crop rotation. Control of gummy stem blight (GSB) should begin soon after the appearance of powdery mildew (earlier if GSB originates from seed or local inoculum sources) although the exact timing remains to be determined, mainly because of the difficulty of accurately identifying this disease on most cucurbits. Combination sprays are recommended because of the need to control powdery mildew along with gummy stem blight and other foliar and fruit diseases (anthracnose, downy mildew, Alternaria leaf blight, and Septoria leaf and fruit spot). The combinations to be used should be determined by scouting for these diseases. Specific fungicides for control of downy mildew should be included if this rapidly spreading disease is reported in the area. Refer to the current Cornell Pest Management Recommendations for Commercial Vegetable Production or local county newsletters for an updated list of available fungicides and their proper use. Appreciation is extended to Louis Hsu for laboratory assistance and to Kent Loeffler for photographic assistance. Portions of the research leading to results were funded by the New York State Integrated Pest Management Program and Hatch Project NYC 153-417.